There are wide inconsistencies between, and even within, countries in how community-orientated care is defined and interpreted. The analysis presented in this book take as a starting point an evidence-based balanced care model in which services are provided in community settings close to the populations served, with hospital stays being reduced as far as possible, usually located in acute wards in general hospitals. 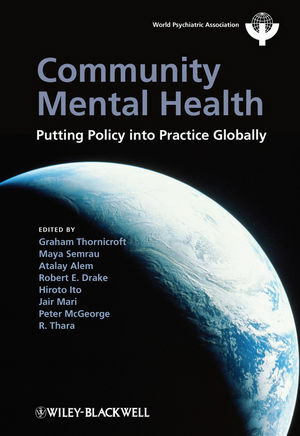 The surprising conclusion from the research is that the same problems arise in all countries, regardless of resource status, and thus the recommendations of this book apply to mental health provision everywhere. This book reviews the implementation of community-orientated care using the balanced care model. It summarizes the steps, obstacles and mistakes that have been encountered in the implementation of community mental health care worldwide and presents guidelines on how to avoid them. It proposes realistic and achievable recommendations for the development and implementation of community-orientated mental health care over the next ten years. These guidelines will be of practical use to psychiatrists and other mental health and public health practitioners at all levels worldwide, including policy makers, commissioners, funders, non-governmental organisations, service users and carers. A core message of the book is that the mental health sector will more powerfully advocate for better services in future through strong and unified alliances, especially with powerful representation from consumer/service user and carer groups. Community-orientated care draws on a wide range of practitioners, providers, care and support systems (both professional and non-professional), though particular components may play a larger or lesser role in different settings depending on the local context and the available resources, especially trained staff. Research by a WPA task force has demonstrated that most of the challenges are common and global, but with local variations. The book is therefore relevant to psychiatrists and mental health workers in developed countries who are trying to deliver better health care on reduced budgets and for those in the developing economies who are in the position to modernise their mental health care. It provides clear, concise guidance on policy and practice decisions, learning from what has and has not worked in regions in the world. The book contains many tables documenting the evidence, supported by an essential reference list, and a Key Points summary for each chapter. Highly Commended in the Psychiatry section of the 2012 BMA Book Awards.